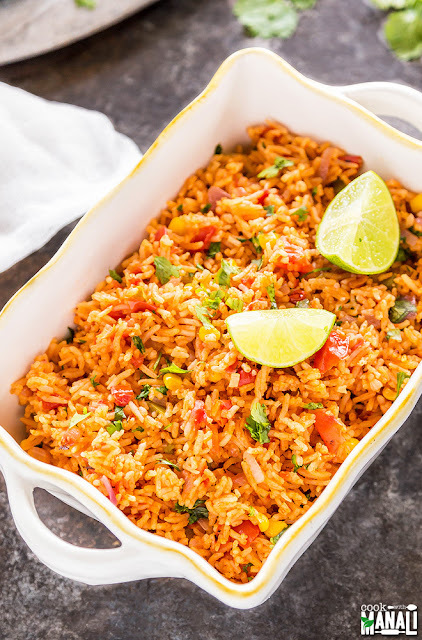 This easy vegetarian Mexican rice is a one pot dish which you can serve as a side or as a part of main dish. The rice is lightly spiced and has corn, tomato, garlic, onion and jalapeno. I served it with poblano peppers but you can serve them with tacos, burrito or just eat them with some refried beans. I think they will also be great in stuffed peppers with some cheese on top. I have used basmati rice in this recipe but you may use long grain. Since I had only basmati at home, I went ahead with it and it worked pretty well in this recipe. Rinse and soak rice in enough water for 15-20 minutes. Drain and set aside. Heat olive oil in a pan on medium heat. Once hot add chopped red onion and cook for a minute. Then add chopped jalapeno and cook for a minute. Add yellow corn and mix. Add cumin powder, salt, pepper and mix. You may also add some cayenne pepper at this point to increase the heat. Add the soaked rice to the pan and saute for 2-3 minutes. Add crushed tomatoes, vegetable broth or water and mix. Lower the heat to medium. Cover the pan and cook for 10 minutes. After 10 minutes, lower heat to low and cover and cook for another 5-10 minutes or till rice is soft and done. Switch off flame and let the rice remain covered. Remove cover after 10-15 minutes. Fluff with fork, add cilantro and lime juice. Serve vegetarian mexican rice as a side or main dish and enjoy!